Harriet’s joy was echoed by the crowd of people outside – all in Venice, Illinois attending “Second Chance Saturday” on Sept. 9, which gave Madison County residents the opportunity to expunge or seal their criminal records. Volunteer attorneys from Simmons Hanly Conroy and the Land of Lincoln Legal Assistance Foundation helped start the expungement process for more than 553 cases at this year’s event, expediting the process by allowing attendees to file all the necessary paperwork at once. Through normal channels, the entire process can take four to six months to complete. Prior to attending “Second Chance Saturday,” Harriet spent the last seven years trying to turn her life around. After she was released from prison, she finished her college degree in Counseling, conquered a drug habit and kept clean, and then focused her energy on finding a job where she could make a difference in the lives of young adults. She was turned down for job after job until recently when she found a place that would give her a chance. Now with her criminal record expunged, she finally has the missing piece that will allow her to start over. 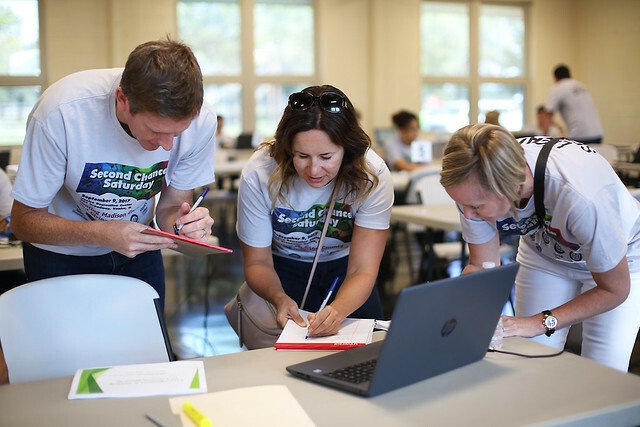 A similar event to “Second Chance Saturday” was held in 2016 at the office of Simmons Hanly Conroy in Alton, which helped more than 100 people start the process of removing past minor offenses, misdemeanors, and other nonviolent crimes from their records. This year’s event was relocated to the southern part of the county to serve historically underrepresented individuals. In addition to helping participants navigate the expungement/sealing process, a team of volunteers from several county agencies assisted with renewing, replacing or correcting drivers’ licenses; purchasing vehicle stickers; registering to vote; and finding employment. Local agencies, businesses and organizations who helped make the event possible included the Madison County Judiciary and State’s Attorney’s office, the Circuit Clerk, lawyers from Simmons Hanly Conroy and the Land of Lincoln Legal Assistance Foundation, Madison County Sheriff’s Office, Venice Mayor’s Office, the Illinois Department of Employment Security, and the Leadership Council of Madison County. Entertainment was provided by the Dirty Muggs band and free food and refreshments were provided by McDonald’s of Granite City. “We are incredibly proud to be a part of such an important event,” said attorney and Simmons Hanly Conroy Shareholder Ted Gianaris. “Last year we called this event ‘Expungement Day,’ because plainly stated, that’s what we set out to do: expunge and seal criminal records. But as we started planning for this year’s event, we realized what we were doing was so much more than expunging or sealing records – we were giving people a second chance. For people like Harriet who attended “Second Chance Saturday,” those mistakes might no longer keep them from the goals they’re setting and the dreams they’re chasing.